Has your house gotten out of control? Need to give it a bit of a restart? Let us here at Clean Arrival give your house a little extra love with our deep clean option. Our deep cleaning services are specifically tailored for houses in need of the most attention and offer the most comprehensive clean. If your house has built up dust, grime, scuffs, and dirt this is your best option. While all our cleaning services are tailors to the focus on the details our deep clean specifically targets the areas that often get the most forgotten over time. We recommend this service to all first time cleans, whether you’ve had a maid for years or are new to the cleaning service world. With a deep clean we set aside a larger amount of time and include a larger list of items, as a result, we ensure all your bases are covered. This way if you are booking recurring cleans we have the ability to get familiar with your home and it’s specific needs, ensuring we can be as efficient as possible while going beyond your expectations. Additionally if its a one-time clean we have the ability to provide you with a longer lasting higher quality clean. 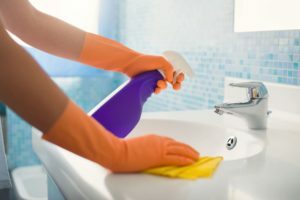 What’s included in a deep clean? Above all, our deep cleans focus on detail work. This means we tackle the areas of your home that often don’t get as much love such as molding, baseboards, high dusting, in addition to many of the scuffs and scratches. To make it easier for you to pick the right service for you check out the list below to see what areas of the house we actually clean. Don’t need everything on the list then check out our standard cleaning service for a simplified clean. Furthermore, we provide a few extra services that you can select when booking to customize your clean. If you look through our options and still don’t see what you’re looking for always feel free to contact us directly. Check out a side-by-side comparison of a deep clean and standard clean check here. *Please note that our ability to remove scuff and stains on your wall may be dependent on the type of paint. Non-glossy paint can be damaged or removed if attempted to be cleaned. **Trash is emptied by request, please inform cleaners of the locations of trash to be emptied as well as outside garbage bins or dumpster. ***Please inform cleaners and management of the type of flooring and finish in your home. Our standard method of cleaning hardwood, title, and non-carpeted flooring is to wet mop using a diluted biodegradable solution. If this is not the appropriate method for cleaning your floors, please inform management to avoid any damage.